Recently we’ve had better luck running into friends we’ve made on the road, and while we were in Florida we had a chance to catch up with Jeff and Sue of Fools Rush Out in nearby Naples FL. 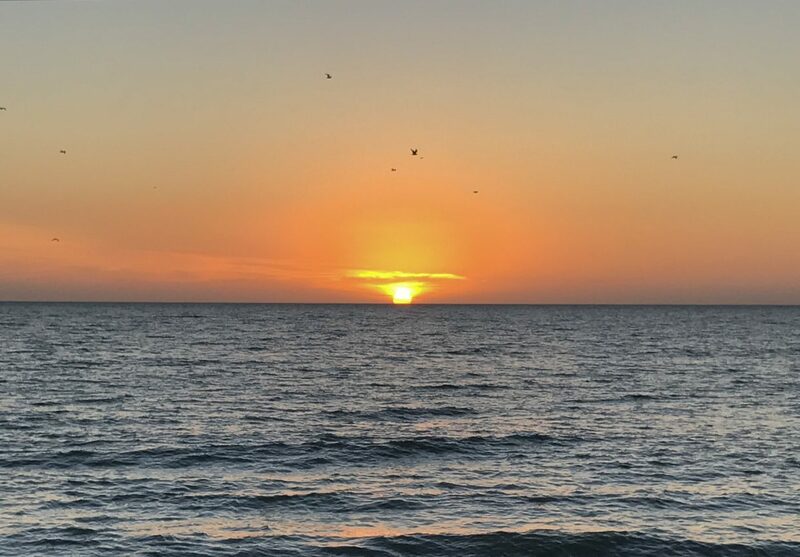 In fact, we spent an awesome evening drinking and snacking on the beach watching the sunset and then the New Years Eve fireworks over the gulf! By early January, Rover’s repainting was finally finished and he looked great! After crashing with Mike’s mom for three weeks it was time to move on. I sadly packed all my sewing stuff back into Rover—I had commandeered the entire dining room space of Mom’s house while we were there, it was awesome! We said our fond farewells, including Opie’s very sad farewell to the swimming pool, and headed to Orlando for 10 days. We had thought about hitting one of the amusement parks but didn’t really feel the pull so we skipped it this time around. We camped at Bill Frederick Park, a nice city park right inside Orlando with lots of shady trees, big spaces, and a nice feeling of quiet away from the city noise. 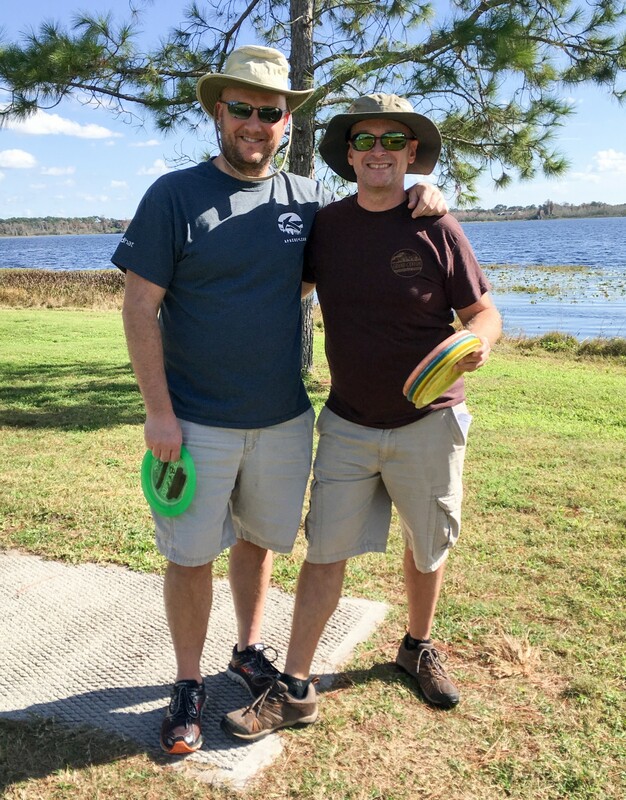 Our friend Mark was in Orlando that week so he came to visit and we all tried our hand at Frisbee/Disc Golf for the first time. We’ve seen disc golf courses in many public park campgrounds but we’ve never tried it. Similar to golf, there are different types of discs: driver, mid-range, and putter. The driver is the lightest and thinnest to get good distance and putter is the thickest and heaviest for the most stability. All of us really enjoyed playing, although apparently I lived up to the stereotype that girls can’t throw and got soundly beaten and unsurprisingly, I woke up with some achy arm muscles. Mike and I may have to invest in a couple cheap sets of discs so I can improve my game! Mark and Mike with their golf discs ready. 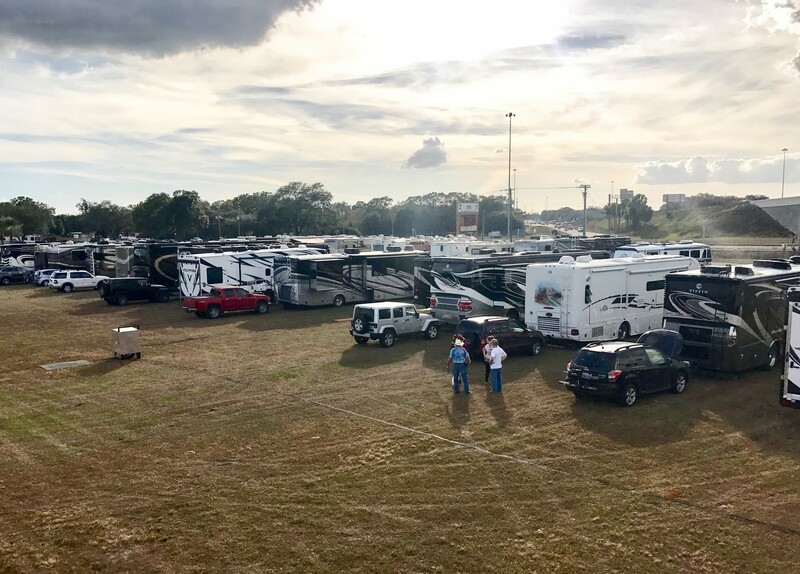 After Orlando, we headed to Tampa for a brief stay to check out the Tampa RV Supershow. While Rover is only 3 years old, we have talked about upgrading to a diesel (or even finding a different gasser) in a couple of years. We love this lifestyle and we have no urge to stop anytime soon. We love Rover and he’s been very good to us, but we’re always a bit curious to see what is out there. 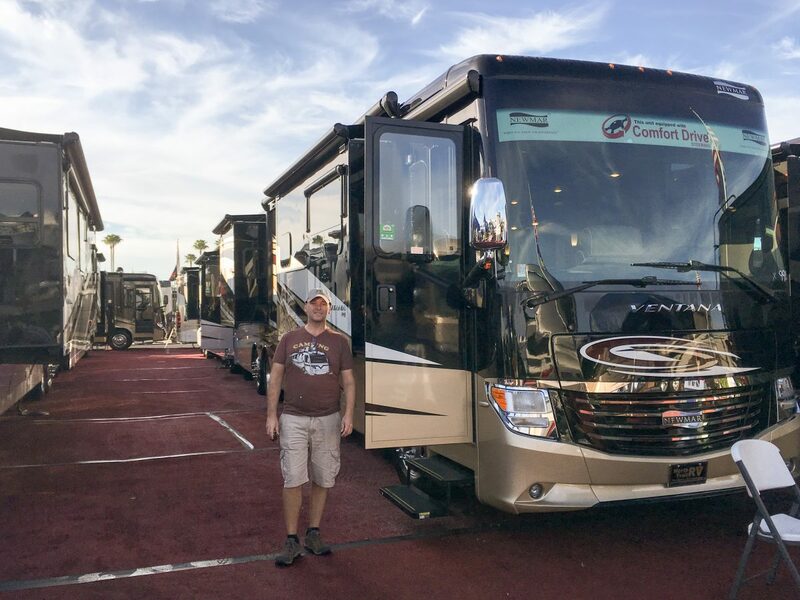 Mike’s been doing research (of course) into various RV brands and he’s been eager to check out the Newmar motorhomes at the show. We also wanted to see Tiffin’s new Phaeton that features their custom-built chassis and provides more storage space and other amenities. Checking out the Newmars at the RV Supershow. This is our second time visiting the RV Supershow. The first was exactly three years ago when we placed our order for Rover! It is a massive show full of every type of RV and accessory you can imagine. You can walk through the million-dollar Prevost (pronounced “pray-voh”) motorhomes, but you had to take off your shoes before you enter! Since we didn’t have much time this visit, we skipped most of the show and just went to the Tiffin and Newmar areas. We’ve heard many great things about Newmars (especially their construction) but were surprisingly underwhelmed in person. The cabinets are much smaller in size (we’d never fit our cereal inside one of those cabinets) and often half-obstructed by pipes or structures. We found ourselves saying “Where would we put our pots? Where would the trash can fit?” The 40-foot diesel Newmar we looked at offered much less storage space than our 37-foot gas Tiffin. We’d find it difficult to full-time with such limited storage. We did like the simpler interior lines and finishes of the Newmar vs the Tiffin Phaetons though. The Phaeton seems to have a lot of fancy flourishes, designs, and woodwork that we find too busy, but it has great storage options, nicer control panels, and interior layouts that we prefer. 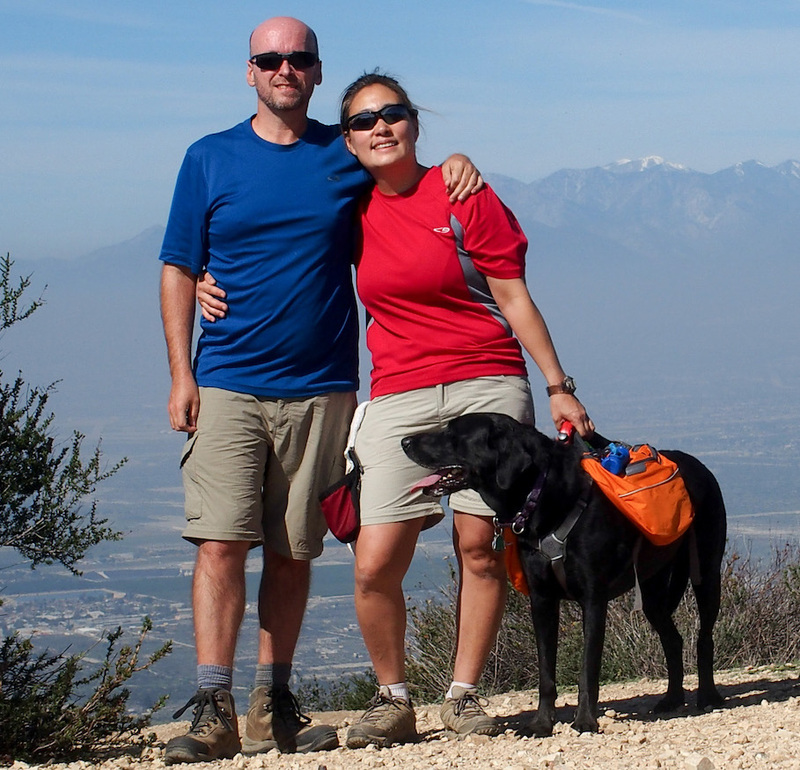 The good news is that nothing “wowed” us, so we won’t be running out to buy a new motorhome any time soon! We dry-camped on the Fairgrounds lawn (with hundreds of other big rigs) the night before the show and moved to the fairgrounds main parking lot the next morning. 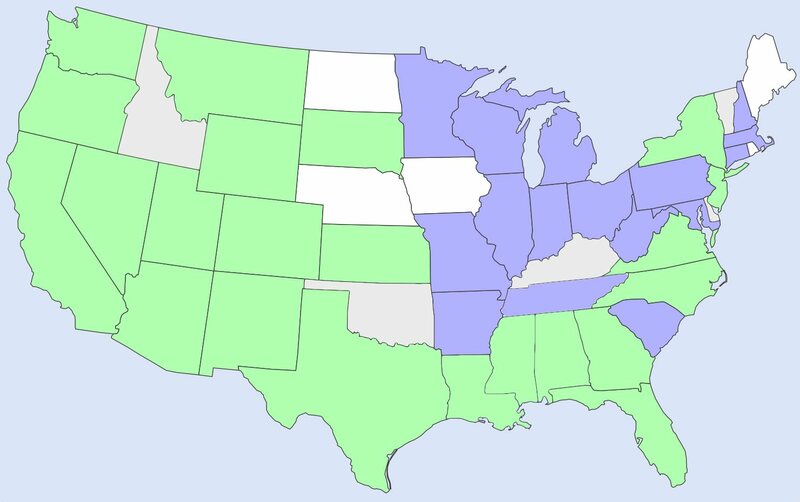 We’d have to leave the show by 2pm so we could hit the road that afternoon. That was NOT a well-thought out decision. The main parking lot allows RV parking but it’s mixed in with everyone else. While we got there when the lot opened, by the time we left at 2pm, the lot was packed completely full, making it nearly impossible for us to maneuver. At one point, we disconnected our car because we got caught at a dead end and had to back Rover all the way back to a tight intersection. Nevertheless, we did make it out of the lot, but let’s never do that again. 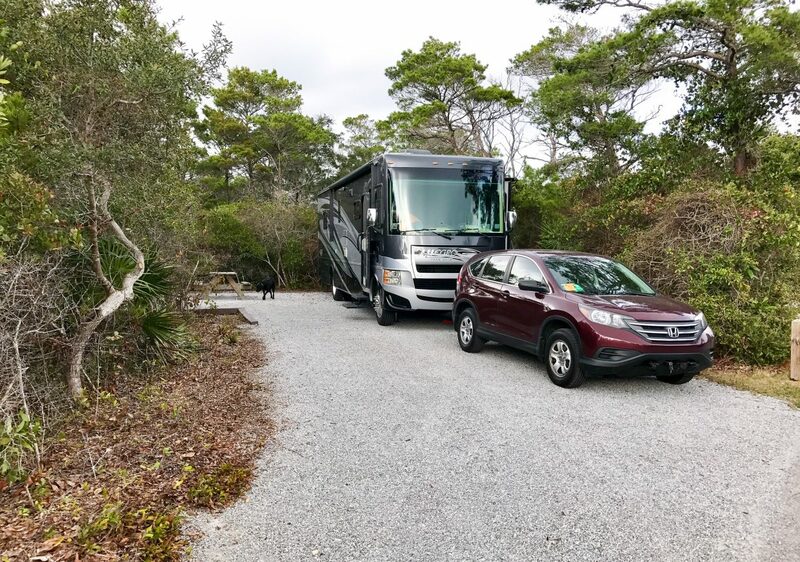 After getting out of that mess, we booked it over to Henderson Beach State Park in Destin, FL for a few days just so we could meet up with some more RV friends. We first met Ben and Lanni in Colorado last summer and they mentioned they would be in Destin for the winter. 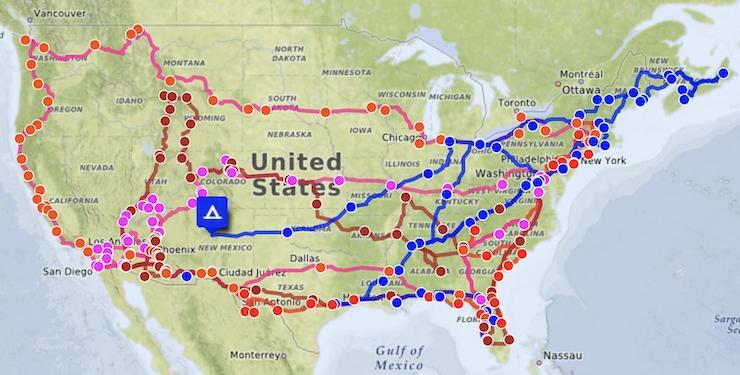 Since it’s on the way to TX for us, we figured it was a good stopping point for a few days. Later we found out that Laura and Kevin of Chapter 3 Travels were in the area at the same time. We met up with them last year when they were just starting out (they are from the DC area like us) and I like to think we hit it off. While we tried to meet up with them in November, the timing (and a pesky broken leg on Laura’s part) didn’t quite work out so meeting up in Destin was our backup plan. Ben and Lanni are avid table-top gamers like us. While in Colorado, we introduced them to Gloom and Munchkin Fu. 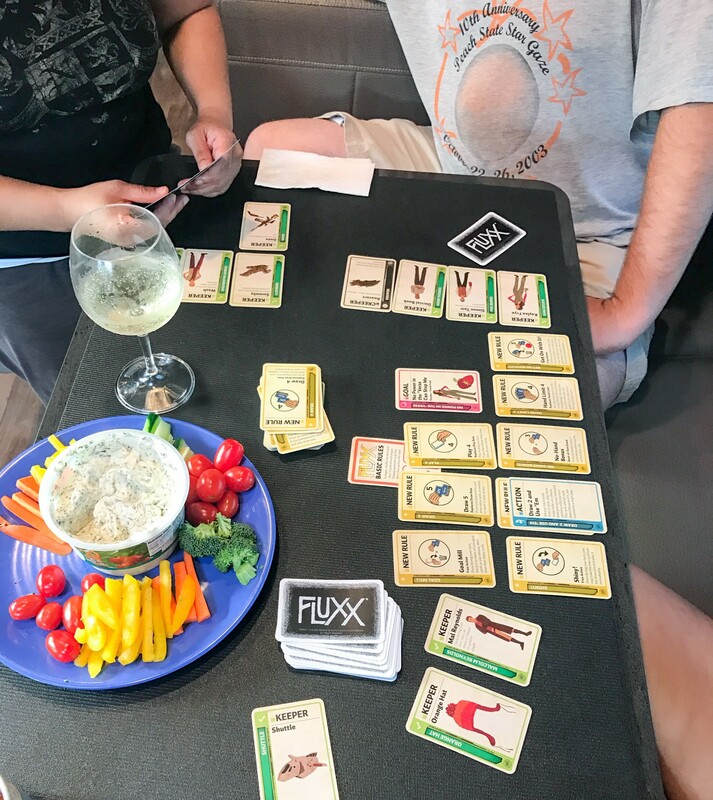 In return, they introduced us to Fluxx (Firefly version) while in Destin. Looks like we’ll be buying a new game to add to our growing stack. 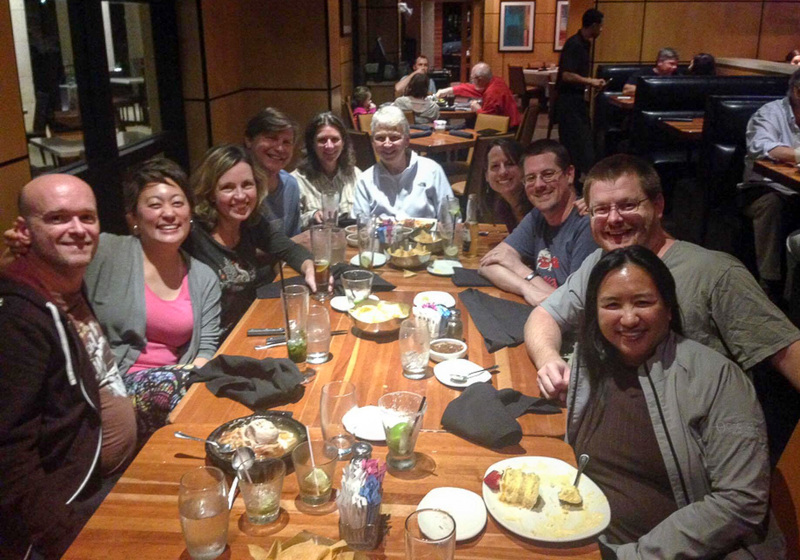 Our dinner plans with Laura and Kevin ended up expanding into a fantastic RVer group dinner! We invited Ben and Lanni while Laura and Kevin invited Nealys on Wheels (Jen and Deas) and Nealys invited RV-A-Gogo (Nancy and Betsy). It was awesome!! I’m pretty sure there must have been at least 3 different conversations going on, lots of laughing, and a fair bit of drinking. We’ve found that meeting people on the road is tough (for us) so this was a wonderful opportunity to meet some fabulous folks. I really hope we end up crossing paths in the future. After our Florida ambling, it was time to leave the Sunshine state and head to the Lone Star State. Probably don’t remember us but we met you guys at Catalina State Park in December of 2015 (I think that was the date). Connie and I had the feisty little red dog, Pepper, who always wanted to play with Opie. Somehow lost your blog name and just now found it. When we met we had a small 30 Ft Thor ACE. We have moved up to a 40 ft Newmar. If you are still thinking of Newmar you might want to take a look at the 4041 Ventana or Dutch Star. We had the same problem as you in trying to find storage space, the 4041 really has it. We kept comparing to our little ACE and nothing seemed to have the same storage until we found this floor plan. We have had it since late October and really enjoy the room and storage. Yes, I definitely remember you, Connie, and Pepper! I remember you two were looking to upsize when we met up. It sounds like you really like the Newmar and the extra space. Thanks for the recommendation, we will have to check it out and see what the storage space is like. We didn’t realize how much storage Tiffin provides until we started looking at other models. Ugh, looks like we JUST missed you in Yuma! Based on your blog, we got here just a few days before you left. I would have loved to cross paths again and chatted about your experiences! Hopefully we will meet again.